It's time for a safari adventure. Click here to play! You'll be roving the dry landscapes of the African desert in order to photograph the unique native beasts found in this land. If you can capture images on these reels of the lions, wildebeests and impalas you will be handsomely rewarded for your work. Keep a keen eye out for the lionesses in your search. These big cats are not only hunters but they act as wild symbols, which means they will replace all other symbols except scatters. If you spin one to five of them across a pay line, you could get up to 10000 times your line bet. The next most valuable image is that of the male lion. 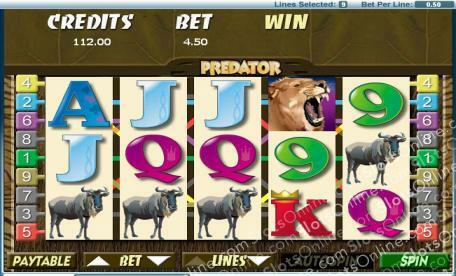 This king of the beasts will bring in up to 5000 times your line bet. Watch for impalas to hop across the reels as two to five of them will get you up to 2500 times your bet. There are plenty of other animals to help you gain your fortune, so be sure to snap pictures of any thing you see. The Vulture icon acts as a scatter. If you spin three to five anywhere, you will multiply your total bet by 5, 20 or 200 respectively. If you spin three or more anywhere and you will trigger a bonus feature. The mighty lioness acts as a wild symbol. Spin one to five of these icons across an active pay line and you will get up to 10000 times your line bet. They will also replace all other symbols, excluding scatters, to help you create more winning combinations. The scatter Vulture symbols will trigger a bonus feature. Spin three or more anywhere on the board and you will take part in a game that allows you to choose from tiles on the board. The object is to get two or more matching symbols to receive a prize. You get six picks and your prize will be multiplied by your toal bet.